The research and design process behind updating a look. 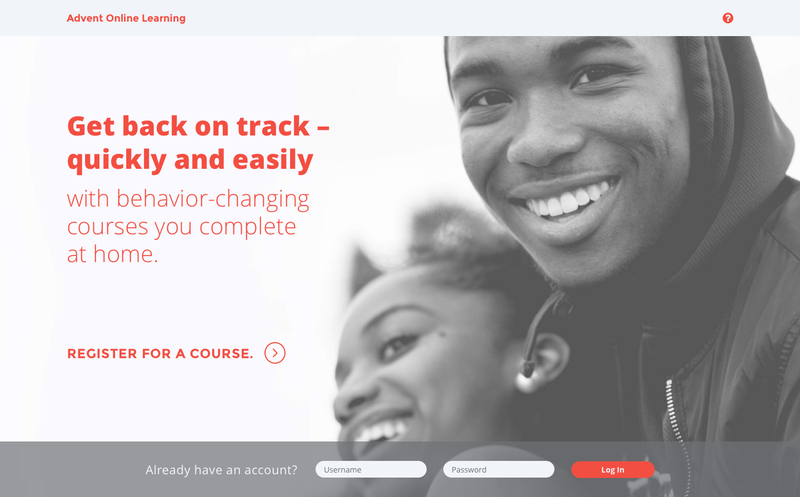 Advent Online Learning is an online course platform for people who committed minor crimes and infractions. It's targeted at first offenders to help them break the cycle of unlawful behavior. I was the sole designer on this project, working with a project manager who interfaced with the client. The client had their own developer in-house. Quick note! I wrote this case study to be more process-oriented, less about on showing off the final project. Images, figures, and some before + afters are used throughout to illustrate my process. They include captions to show how they tie in to the text. Shots of the final design are also interspersed, but without captions. The client's goals were straightforward. They were working off an old, utilitarian design that had been built to release the content as quickly as possible, not with the users in mind. They wanted a cleaner, modern upgrade. They only had two requests regarding design. One, that we maintain the existing brand colors. Two, that we introduce full-width cover photos at the top of most pages. Beyond that, we were only constrained by the requirement to reskin the current site without restructuring the content. What I did know from Advent's user research was that visitors to the site were often confused and had trouble navigating. Considering the low smartphone ownership rates of rural areas, and the correlation between smartphone ownership and technological literacy, this was unsurprising. After collecting this data, I was certain that a simple, clear site flow was paramount to the usability of my redesign. Site flow for student users. I've made some updates to my typical workflow since, but at the time I followed atomic design principles in all my projects. I like to start out by mapping out all the building blocks that go in to a screen (also known as "molecules" in the language of atomic design). For more complex projects, I start at a higher level and consider all the required page templates first. That wasn't necessary for this project as all the pages follow the same template. After creating the site flow and thinking up a few ideas on structuring the content for usability, I came up with a complete list of building blocks. With a site flow and building blocks in place, the wireframing process becomes very intuitive. My priorities are ease of use for the user and displaying an appropriate hierarchy of information. With this in mind I mock up a mobile layout first, and then a desktop layout. What's the objective of this screen or section, big picture-wise? What are users looking for, and how are they using the screen based on their different goals? How does my visual design reflect their intentions and their needs? When I get lost in some nitpicky design detail or code snippet – happens to the best of us – these points bring me back to focus on the big picture. They also help a great deal when it comes time to share the design with the client. This way I can justify every design decision I've made with evidence, not merely because I think it looks good. Objective trumps subjective every time. An example of this was my process for selecting the hero images. Sourcing photos was left up to me, so I used it as an opportunity to inject some warmth and humanity into what was otherwise a very minimal app. The original images showed people engaged in the behavior the course was designed to change. For example, "Alcohol and Substance Abuse" portrayed a drunk woman collapsed on a table. "Traffic Safety" showed a raging man behind the wheel. This struck me as a missed opportunity to convey a more uplifting message, one that tied in with the program's aims. I picked out a few stock portraits that stood out to me as more raw and honest than most. They give the impression the subject has been through hard times, but has come out strong on the other end. Course attendees are going through a challenging time in their lives. The new photos subtly make it a more positive experience to use the app. It was clear to me that we would lose some design details and interactions if I didn't include supplemental information in the handoff. This went beyond what the developer requested from the project manager. But it was important to me to include the necessary info to match the code and design as close as possible. So I included a suite of supplementary files, and ensured all was in order in the file format he requested. Get totally clear on the spec and scope upfront. Early in my career, I was uncomfortable with asking more than a couple questions. I felt it made me look like I didn't know what I was doing. But after a couple projects under my belt, I realized the opposite is true! With experience, I learned to recognize where the questions and confusion most often come up. Being a good designer doesn't mean arriving with all the answers. It means being able to see where the holes are and ask the right questions to fill in the picture. This applies for every step of the design process, by the way, but is especially true in the early stages of any project. Just because a client isn't especially research-oriented, doesn't mean a designer can't be. When I didn't have much to go on, I went out of my way to get some data I knew would help me better understand the users and their needs. Lay the ground work for a great design. Visual design is the most fun part for me, and it's easy to get ahead of myself when it's almost time to start making things pretty. But an aesthetic site is worthless if it doesn't suit the client's objectives or make sense to the users. Nowadays I feel uncomfortable designing when I don't have the research and content to back it up. Go the extra mile to get the best results. There are points throughout the project where I could've done no more than what was asked of me, but I wouldn't have been happy with the result. This is especially true on projects like this where there's no opportunity to iterate after launch. It's worth it to channel my perfectionist and push through that last 5% to make things as perfect as possible for presentations and handoff.